There is still hope to contain the threat. There is a hope, but not certainty. I'll explain below. Sandy is but one most obvious and direct example - showing us that now we are already threatened by destructive force of warming; there are many other examples. To remove the threat - and let our children to inhabit Earth which is not threatened by warming anymore, - it would be required to remove the main cause of warming: increased concentration of greenhouse gases in Earth athmosphere. Scientific projects exist which attempt to do it - to remove carbon dioxide out of athmosphere. However, when one studies what progress such projects have made, it becomes crystal clear - granted that some basic knowledge of physics and chemistry is used, too, - that mankind won't be able to remove greenhouse gases from the athmosphere with any rate comparable to putting into it (by burning fossil fuels). All projects of this kind confirm very basic idea from chemistry: to break something which is formed as a result of energy-generating chemical process (burning coal/oil/gas), same-or-larger input of energy is needed. Sadly, most of our energy is generated - and will be generated for a few more decades at least, - from burning fossil fuels. The option of storing greenhouse gases in liquid form (underground, etc) is proven to be practically impossible - on scale and timescale which is required to make a difference. Carbon dioxide just leaks back, and sheer size/number of required underground storage resevoirs is way beyond and realistical possibilities. In sum, all above means that mankind will emit more greenhouse gases, much more, and gases will stay in the athmosphere for a long time. Thus, the main cause of warming is impossible to remove, for at least two more decades. It will be growing, too. Thermal inertia of world ocean (~20...25 years) and masking effect of global dimming (which will drop ~5 years after we stop burning fossil fuels) will add to it dramatically, with time. Even if new extremely powerful source of energy would be found (such as, perhaps, fusion reactors), - it will take at least 2 decades to re-built mankind's energy generation infrastructure to be mostly (or completely) non-greenhouse-emitting. And much longer than 2 decades for transportation sectors, too - to replace all cars, ships, planes, agriculture machinery with new ones which work without burning fossil fuels will probably take 3+ decades. Logic dictates that the only solution is to counter-act the main cause of the warming, then. That's why it has to be geo-engineering - whatever method(s) used, that is. Geo-engineering won't be a permanent solution, though; but it's the only way to get at least several decades of functioning global economy, sciences and industries to develop and build non-fossil energy source(s) (like fusion reactors of adequate number and capacity) before we can hope to clean up the athmosphere of excessive greenhouse gases - and thus be able to stop continuous geo-engineering. Geo-engineering required to contain warming within tolerable limits is said to be dangerous in its side-effects, especially in yet unknown side-effects. It may be that those side effects would lead to even worse problems, and thus mankind will be forced to stop geo-engineering and adapt to destructive warming, with all losses it would bring. Thus the threat of it will nonetheless be present even if we do all geo-engineering we can. 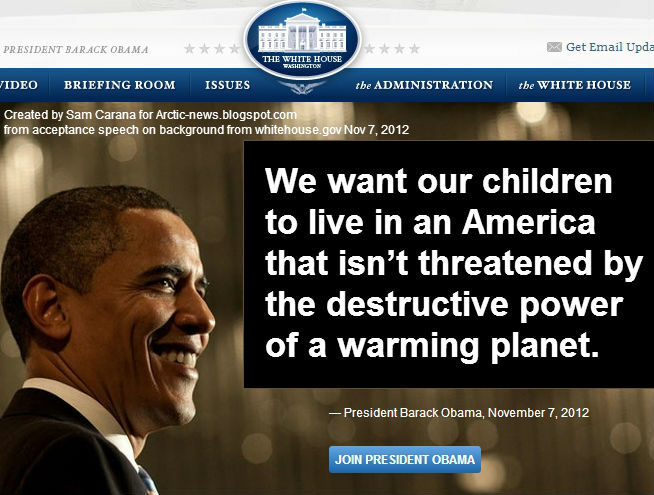 Mr. Obama, the question now is not whether our kids will be threatened by global warming; they will be. The question now is whether most of our kids and grandkids will be able to contain the threat and survive - or die (among most others) prematurely and unnaturally due to warming raging uncontained. Right off the bat someone pointed out on discussion at Google+ the Red was largely rural country and Blue more peopled. However, -and i was trying to get back there to say specifically that the Red regions of US are also to Dust Bowl like in a few years.. The Red is of country, rural farm land largely the heart of the food producing area too.. On line at this site in most recent Diagram of Doom, Food is Drawn as Engine to confront accelerated global warming; Fuel of the means to break deadlock and to unite the world for the common good. Food is discussed on site here at Arctic News and is a key element to revaluation of worth for even financial forces-that-be.. World food production is needed for peace and for time in which to alter Earth's path to oblivion now..